Info: Im sure the image has explained the situation so far. 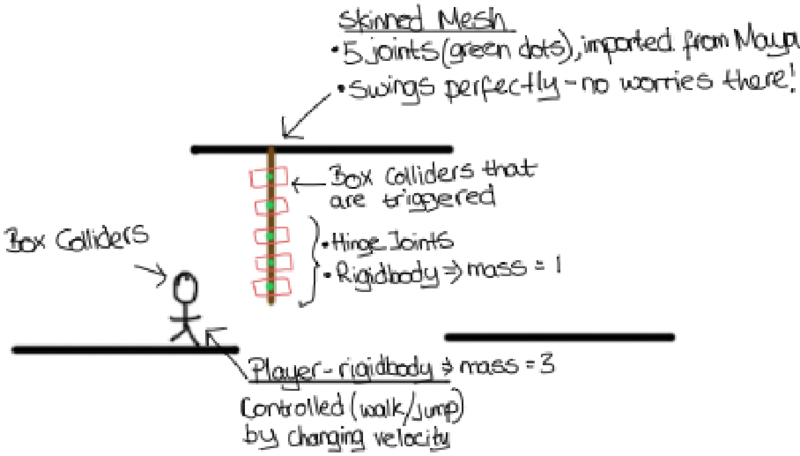 The rope is triggered because the player will be able to swing it side to side only when he is on it. Problem: The problem is that i cant seem to stick the player onto the rope. Should i make the player kinematic once hes on the rope? Note that i still want enemies to be able to hit it even on the rope. I dont know which method is the correct way of doing it, do i parent it to the joints that it collides with? I dont want the y and x rotations to interfere with the player. Guess i just need some logical guide please. I think I read somewhere that you're supposed to do this kind of thing by parenting the object to the point that they are attached, but if you don't want rotation to affect it you could update the position each frame after the physics have been applied? I'm part-way through achieving this myself at the moment. I took care of the rope-attaching by applying a distance collider to my player, with the segment of rope's rigid body as my connected body... the problem with this is that player gets sucked in to the pivot point of that rope segment.